He’s staking his position as Pied Piper of the Proletariat. Ed Thompson, Libertarian candidate for governor, added politics to his lengthy and colorful resume of working-man jobs - from boxer to gambler to prison guard to bar owner. He easily won election as mayor of Tomah. 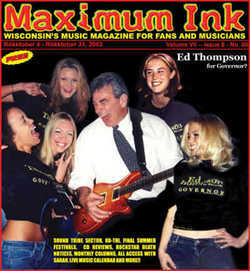 So is the Ed Thompson mystique genuine, or is the reality best reflected in the Libertarian party line? Who does Thompson see as his constituency? Certainly, his appeal to the “Joe Six Pack” voter will be tested. But his campaign has also focused on younger voters. “It’s time to take our state back for the young people,” he said. “We have strong backing amongst college students, and I think that the young will be a big part of the campaign.” He’s had a rapport with younger generation long before his political career. “I used to have a rock & roll bar in Elroy,” he said. “Music has been a big part of my life - music defines the ages,” he said. One key Thompson ally is not quite a supporter…but not quite an opponent, either - his brother (and former governor) Tommy Thompson. Tommy Thompson has verbally endorsed McCallum, “but he promised me that he would vote for me, and also promised me $500 towards my campaign,” Ed Thompson said. So…has “big brother” come through? “He’s given me $200 so far - I’m still waiting for the other $300,” he said. “He told me he’d give it to me on an installment plan - we’ve had a few words about it.” But does Ed Thompson really think his brother is good for his promise? “He better be,” replied Ed.